Local search engine optimization (LSEO) is a powerful digital marketing strategy for business owners wanting to sell to local customers, if you’re not showing up in local search, you’re missing out. Increased Web traffic, brand visibility, and an increase in revenue are all advantages of investing in SEO. To take control of your local search results, follow the local SEO checklist and best practices below. Keyword research is a fundamental step for every successful SEO campaign. It involves discovering and analyzing phrases and terms that people are actually typing into the search engines to find local businesses like yours. Google uses the text and hidden code on a website to understand what it’s about. It’s very important to optimize a website around keywords that people are actually using. For example, a painting company may be inclined to optimize their exterior painting page around the term “exterior residential painting” because that is the term the industry uses. However, through keyword research, they may find that people are actually using the term “home painting service.” If that’s the case, their page should be optimized around the term “home painting service”. So, how do you discover which keywords to rank for? To start, brainstorm keywords yourself or ask customers, friends, or family what keywords they would use to find a business like yours. Take your list and input them into Google’s Keyword Planner to find new keyword ideas and to get the estimated search traffic for those keywords. Google’s tool will only provide you with advertiser competition, not SEO competition, but keywords with a high ad competition will normally have a competitive SEO score. Try to find a set of keywords that has at least a hundred people searching each month, but with medium to low competition levels. Then add them naturally into your titles and meta descriptions. True keyword research is an in-depth and detailed process. Check out Backlinko’s Definitive Guide to Keyword Research for a guide to keyword research. Your title tag is one of the most important on-page SEO elements. It is the main text that appears in search results. It also appears on top of your browser tab and when saving bookmarks. Titles provide users with a brief overview of what to expect when they click, and titles also tells Google what your page is about. Your title should include the keyword you are trying to rank for, while at the same time accurately describe the page. For more information on Title Tags, check out this guide. The purpose of a meta description is to provide the user and search engines with a brief synopsis of your page. Having interesting and descriptive meta descriptions may increase the frequency that people click on your result when it is shown. You can use this tool to preview what your titles and meta descriptions would look like in the search results. Next to SEO, N-A-P are the three most important letters in local search. NAP is short for Name, Address, and Phone Number. If you want to show up in local search, it’s crucial that Google understands where your business is located. Google is able to pick up NAP information on your website as well as on other sites around the web. It uses the consistency and quantity of NAP mentions as a ranking factor for local search. The more often your business information is found on the web, and the more consistent it is, the higher your visibility will be in local search. Over 92 percent of consumers read online reviews to find local businesses and services. On top of that, 60 percent of consumers judge a local business on its overall star rating with 43 percent find 3 out of 5 stars to be the minimum rating before consulting with that business. With so many people resorting to online reviews for business recommendations, it is imperative to get positive reviews. The quantity and quality of your online reviews play a direct role in our search visibility. The more 5-star reviews your business has, the more online exposure it will receive. To get positive reviews you will need to focus on creating an amazing customer experience. After every job is finished, politely ask for feedback. Google My Business, Facebook, Yelp, Foursquare, Houzz, and Angie’s List are great places to receive and reply back to reviews. Read more about how online reviews affects your business and it’s online presence. Image optimization is an art in the SEO world. Search engines don’t see images the same way you or I do. Because of this, we need to give them additional information to describe the image. This can help increase the rankings for your target keyword. Title Text: This text will display when a user hovers over your image. It should include your keyword, and describe the image. Example: Home Painting Service in Portland. Alt-Text: This text will display if an image fails to load. This is especially useful for the visually impaired. Again, this should include the keyword and describe the image. Size: Before uploading to a website, images should be compressed and properly sized. You can use a tool like Photoshop or a free web tool like Compress JPEG. Anchor text refers to the visible, clickable text in a hyperlink. Google uses the anchor text of a link to understand what the page is about. For example, if you hyperlink the words “Home Painting”, Google will assume that the page you’re linking to is related to home painting. Within your website content, you can hyperlink keywords to the related service page. This helps Google understand what your pages are about, and can lead to increased rankings for those keywords. In the example above, you would want to link every mention of “home painting” to your home painting service page. If users are feeling frustrated when visiting your website due to a poor mobile experience like small text, needing to pinch the touch screen to zoom in, slow loading time, then you should update to a mobile friendly website. Most mobile-friendly websites feature responsive web design, meaning that it is able to adjust to fit the screen size of any device. Responsive websites are easier to manage from an SEO perspective. Alternately, you can develop a separate website designed specifically for mobile. In April 2015, Google announced a mobile-friendly update to its algorithm, which resulted in penalties against websites that were not optimized for mobile devices. Google also plans to roll out another mobile-friendly update in May 2016. 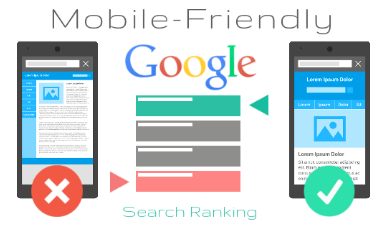 Failing to comply with Google’s Mobile Friendly guidelines will result in a major loss in mobile search traffic. A citation is an online mention of your business with all or some of your NAP information. They generally take the form of a local listing in an online directory like YellowPages. A social profile is like an upgraded version of a citation in that it is often more trustworthy, unique, and customizable. Examples of social profiles are Facebook, LinkedIn, and Pinterest. To build your website’s visibility, you will need to create as many relevant and high-quality citations and social profiles as possible. Be 100 percent consistent with your NAP information. Always use the exact same business name, address, and phone number. If you move locations, you will need to update your NAP information on your website, citations, and social profiles. Write unique business descriptions that summarize your company’s history, niche, products, and services. Upload at least 5 relevant, high-quality images, not including your company logo. Select up to 5 relevant business categories with the first 3 being the most important. Use a spreadsheet to track your passwords and usernames. Delete duplicates. You only need one citation per location. Google processes over 3.5 billion searches per day. If you’re not listed on Google, you’re missing out. Google My Business, or GMB for short, is an incredible marketing platform for small businesses. Manage and update how Google displays your business information. Access insights on how users find your business. 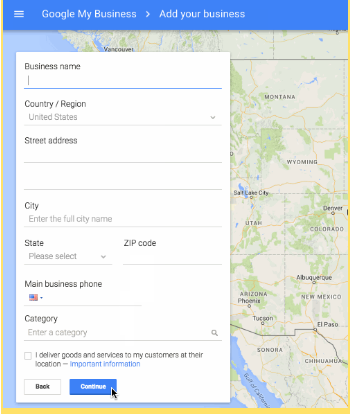 Be found on Google Maps and help customers find directions to your business. To list your business, go to Google My Business and type in your business name and address into the search bar. Click on your business to claim your profile. Then, check the box “I am authorized to manage this business…” and click “Continue.” Review your business address and make changes, if needed. Click “Mail” and Google will send you a postcard with a verification code. Once received, enter the code in Google My Business to complete the verification process. Click “This doesn’t match. Add your business.” Fill out the form with the most accurate information, then click “Continue” to proceed. After reviewing your address, click on “Mail.” Google will send a postcard with a verification code that should arrive at your business location in 1-2 business weeks. Enter the code in Google My Business to complete the verification process. While waiting for your postcard to arrive, you can update your business address, description, categories, hours of operation and map marker. You can also upload images that will be shown in the local search whenever someone searches for your business. To make any changes, click on the hamburger icon on the top left to open the menu. Click “All locations.” Then click “Manage location” to start editing. Schema markup is code that you can add to your website that helps search engines better understand certain types of information on your website. All local businesses should utilize local business schema. This special code feeds your location and contact information directly to Google. Having this schema implemented on your site adds local trust and authority, which will help increase local rankings. Some schema markup can generate rich snippets, which are enhanced elements to your result on the search results pages. By giving users a better sense of what to expect before actually visiting your website, users will be more likely to click on your page and stay on your website longer. 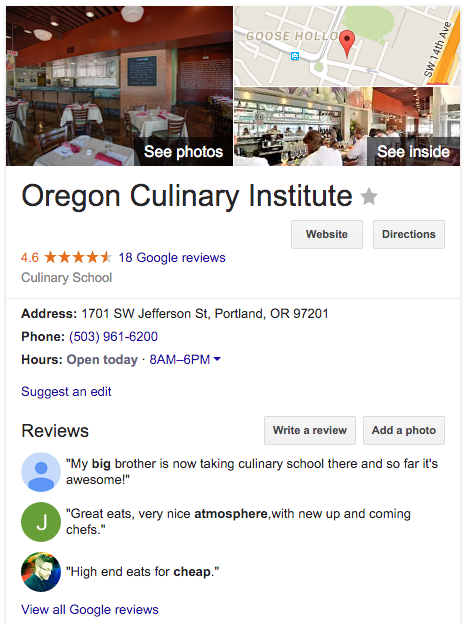 Google currently supports rich snippets for review ratings, recipes, organized events, videos, and news articles. For more information on how to utilize schema markup, check out this guide from the Search Engine Journal. In Google, a link to your site counts as a “vote”. 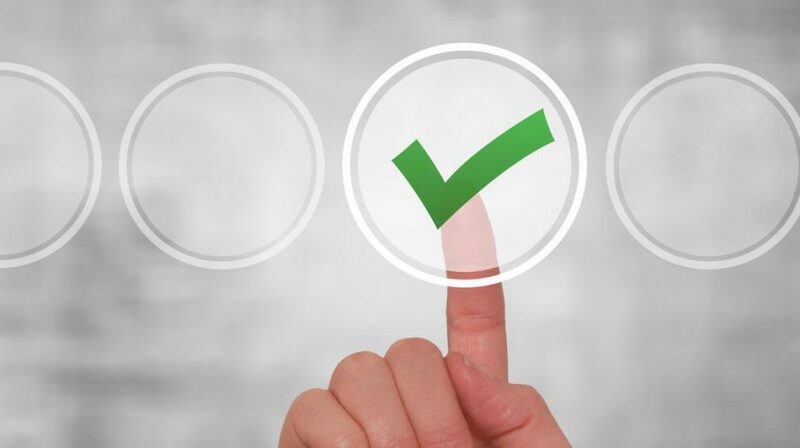 The more “votes” a website has, the more often Google will show that site to its searchers. Links pass trust and authority. For example, if Forbes, Business.com and the Wall Street Journal all link to a website, that website will gain some of the trust and authority from these publishing power-houses. Most websites will naturally have a few links, but you can increase your links (and your rankings) by link building. Link building is the process of outreaching to authoritative, high-quality, and relevant websites to persuade them to link back to your website. It can help establish your brand, build your online exposure, and increase your website’s ranking and traffic. For example, your website may be mentioned in an online editorial. If the editorial website has a high authority, then it can greatly benefit your website. Link building can be a daunting undertaking that requires regular outreach and follow up. However, you can acquire quality links for your website and foster new relationships in the process. It’s a win-win! Following this 12 point local SEO checklist and best practices can significantly help your website outperform competitors while building your brand reputation and exposure.